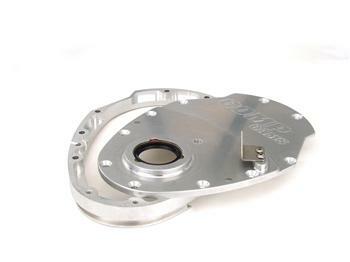 This steel Small Block Chevrolet timing cover features a welded thrust plate tab for use with a cam button. It allows adjustment for correct end play without additional modifications and includes gaskets, seal and bolts and has a black powder coated finish. The COMP Cams Three-Piece Billet Aluminum Timing Covers for Small and Big Block Chevrolet engines allow access to camshaft timing adjustments without having to remove the harmonic damper or disturb the oil pan seal. Designed to be lightweight yet rigid, these billet covers offer convenience and performance in one easy-to-install package. The COMP Cams LS Front Covers for street/strip applications fit all LS1, -2, -3, -6 or LS7 engines, OEM and aftermarket, including the RHS LS Race Block. The LS Covers feature provisions for timing pointer, OEM camshaft sensor and any regular BBC crank trigger. Available for either standard snout (LS1/6) or long snout (LS7) crankshafts, the covers easily fit double roller timing chains and high pressure/volume oil pumps. Both covers come with gasket and crank seal; no modifications needed.